Every day, we choreograph the infinite movements of fresh food and consumer goods across the United States and Canada. 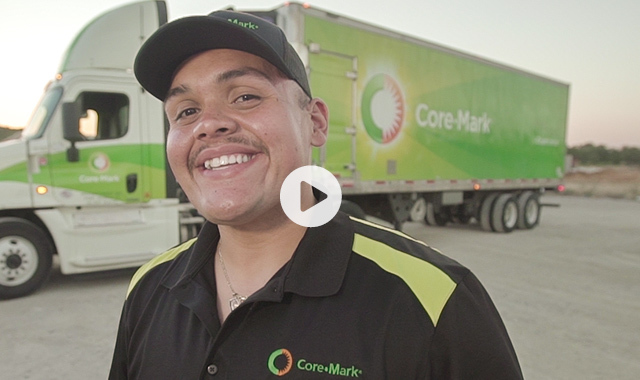 Established over 130 years ago, with approximately $15.7 billion in sales and 32 divisions across the United States and Canada, Core-Mark is a leading distributor and marketer of fresh food and consumer packaged goods to the convenience retail industry. As a Core-Mark driver, you are an integral part of our business. You are the face of Core-Mark and primary point of contact for our customers. Many of our drivers have been with us for as long as 10 to 30 years. And why not? We offer job stability, a positive work environment that feels supportive like your own family, state-of-the-art equipment to make your job easier, opportunities to grow within the company, and benefits to help you stay healthy and to balance work with your personal life. We help you meet your long-term financial goals and you’ll enjoy most nights at home. A Core-Mark Story. Meet James.